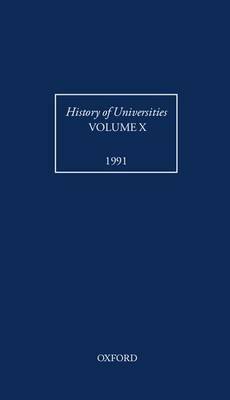 Volume X of History of Universities contains the customary mix of learned articles, book reviews, conference reports, and bibliographical information, which makes this annual publication such an indispensable tool for the historian of higher education. The articles cover a wide chronological and geographical range. They include studies on the financing of university education in twelfth and thirteenth-century France; the early modern University of Prague; Newman and Tractarian Oxford's idea of a university; and universities and elites in modern Britain. Its combination of original scholarship and comprehensive bibliographical material ensures that History of the Universities, Volume X is both intellectually stimulating and a necessary work of reference.